I've been remiss with my blogging over the last few months - definitely not posting as regularly as I would like to, and it's been ages since I've posted anything over at I Heart Cooking Clubs. I miss my friends and, since it's pot luck week this week, I thought I'd join in with a quick and easy Donna Hay dish that's become a bit of a favourite of mine. Now let me preface this by saying that I've always been very firmly been of the view that a baked risotto will never be as good as a traditionally prepared version, a view that appeared to be supported by others I know who have given it a try. I was pretty sure that as long as my backside pointed to the ground (as they say), I was never going to venture into baked risotto territory. Well, one should never say "never". I'd had Donna's recipe for this Prawn, Leek and Lemon Risotto bookmarked in my copy of "Fast, Fresh, Simple" for ages because I think this is such a winning flavour combination. Donna's version is however a baked one, and I was pretty sure that I would just take those ingredients and use them in my usual stirred method for making risotto. A couple of weeks ago though, I was really hankering for some risotto on a cold and miserable winter week night, but I had other things I needed to be doing and just didn't have the time to spare standing over a pot for 20 to 30 minutes. So, I took a deep breath, threw caution to the wind, and made my first baked risotto. I fully expected that without all that constant stirring my risotto wouldn't have the creaminess I was used to from my usual version, but I was surprised to find it was plenty creamy - I think a good knob of butter up front, and another one to finish with, probably helped with that, and I have the feeling that using my enamelled cast iron casserole dish also helped. So final verdict - no deficit on the "creaminess" front, and the resulting risotto was just about as good as a stirred version. In my mind, however, a large part of the joy of risotto comes from the sheer pleasure of standing and stirring that pot for up to half an hour - it's a great exercise in presence and mindfulness, and that matters to me a great deal, and I have the belief that it is this which translates into superior flavour rather than just the physical alchemy of stirring those starchy grains of rice around for 20 minutes. So, yes, I think a stirred risotto will always be superior - you will taste the love that's been stirred into it in every mouthful - but for a quick mid-week fix when you have other things to get done this is a great alternative, and I loved it so much that I've made it several times since. I hope you'll give it a try. Put olive oil and one generous knob of butter in an ovenproof dish, which has a tight fitting lid. Set dish over medium heat, and once the butter has melted add the leek, garlic and lemon zest to the pan. Cook for several minutes until the leek has softened, but not browned. Add the rice to the pan and stir constantly for a couple of minutes until all the rice is completely coated with the oil and the grains look slightly translucent around the edges. Add half the lemon juice to the pan, and stir constantly until all the liquid has been absorbed. Now add all the stock to the pan, remove from the heat and cover tightly. Place pan in the preheated oven and cook for 25 minutes. Remove from the oven, and set the pan over medium heat again. If all the liquid has already been absorbed, add a ladleful of hot water to the pan along with the prawns. Stir constantly until the prawns are cooked through - about 4 or 5 minutes. Remove from the heat, stir in the other generous knob of butter, the remaining lemon juice, parsley, salt and pepper. Cover and allow to stand for five minutes for all the flavours to infuse, and then serve immediately. If you would like to get to know Donna Hay a little better, and to see all the wonderful fast and fabulous dishes my friends have come up with, then do go visit I Heart Cooking Clubs and check out the links. Because it's been a while since I've visited some of my other friends, I'll also be sharing this post this week at Weekend Cooking hosted by Beth at Beth Fish Reads, and at Foodie Fridays hosted by Designs by Gollam. Your risotto dish looks really delicious! Perfect creamy texture and with my favourite ingredients, prawns and leeks! This is a comforting and satisfying meal to enjoy any day of the week! Oh this looks really good. I've never made a baked risotto, but I have made pressure cooker risotto,and I bet the results are similar. The taste and texture are there, but you definitely don't have the connection with the dish that you do when you stand my the stove and sir. I love Donna Hay's recipes. 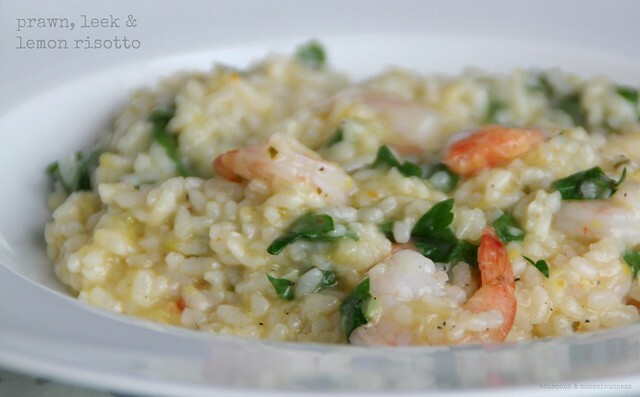 Your risotto looks very creamy and soul-satisfying! Hi Sue! You have made a dish with some of my favorite ingredients. I have not tried baked risotto yet. We did just make a short grain rice dish, risotto type rice, and I baked it. Good stuff. I didn't know there was such as thing as baked risotto! I will definitely try this, but am bookmarking it for fall/winter cooking. I don't eat prawn but one look at this tells me it is delicious. 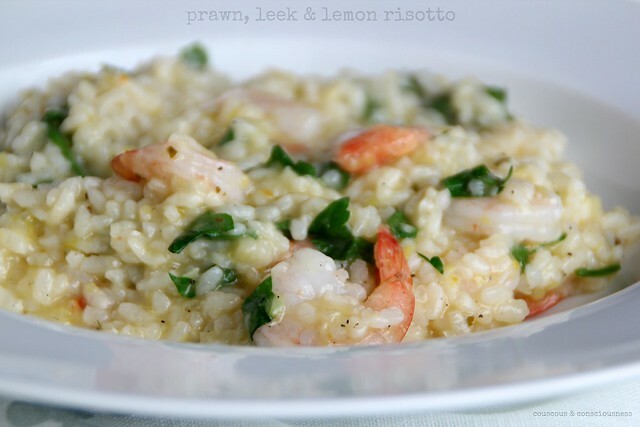 I love a creamy risotta and I use leeks liberally. Oh, Sue. I've missed you so! I always love reading your posts. This looks to be a winner in the risotto department. In fact, it looks downright mouthwatering! I'm happy that the baked method worked for you. I do agree that a nice cast iron enamel pan yields superior results. Like you, I love to stir risotto but seldom have the time for it. I would be inclined to try this recipe in my enamel pan. I think the baked risotto I made utilized chicken and we all know how chicken dries out in the oven (especially without a lid). I feel certain this recipe would be a hit! I've never heard of a baked risotto either... will pin this and give it a try! The picture at the top gave the impression of a well stirred, creamy risotto. I'd give this baked version a try. Very interesting alternative to the traditional version. Thanks for bringing this dish to the party. I made this once and was amazed at how good it was - baked and all. Welcome back to IHCC. I've never tried Risotto, it looks really good!